This LED projector is specially designed for home theater, business conference, entertainment, etc. It is characterized by 60 lumen , 480 *320 resolution and 1000：1 contrast ratio. Projection size is 20-80in along with 0.8m-2.95m projection distance. Various interface for you to enjoy videos or movies. Projection size is 20-80in along with 0.8m-2.95m projection distance. Enjoy high definition movies at your home with 480 *320 and 1000：1 contrast ratio. It supports support support 1080p full HD video decoding. With 2.4 inch LCD TFT display, it contains an integrated LED light source and 3 pieces of glass lenses, manual focus with a simple Projection system. LED Lamp has more than 50,000 hours life. Turn your living room into 3D cinema in a minute, enjoy it without going to cinema. The high definition portable LED Projector is specially designed for home theater, entertainment, business conference, education training, etc. 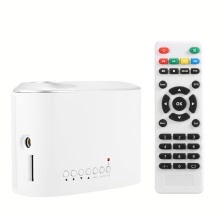 Multi-function Interfaces HD / VGA / USB / SD / AV / AUDIO OUT /TV Port. Various interface for you to enjoy videos or movies. Equipped with built-in speaker, you can enjoy audio or connect external speakers or earphones through 3.5mm headphone jack .